Following Jeremy Corbyn‘s election as the new leader of the Labour party on 12th September, John McDonnell was appointed shadow chancellor of the Exchequer. The shadow chancellor is an informal title referring to the lead economic spokesperson for the opposition in the British parliament. 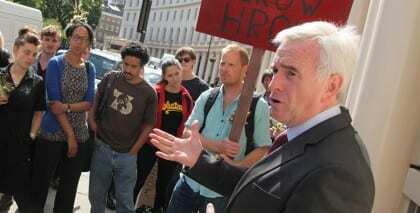 McDonnell is a basic income supporter. He hosted a session for a Citizen’s Income of ‘The People’s Parliament’ on 4th March 2014, and spoke about ‘the importance of a Citizen’s Income to our current situation and of how its implementation might become politically feasible.’ He also gave a speech at the Citizen’s Income Trust conference held on 6th June 2014. Wow the day l would a leading politician doing the right thing in relationship to equality and fairness. No we Greens have to convince him of a Living Economy…which paraphrasing the words of Nobel Laureate Bohr, it’s at another upper level of energy if you can appreciate this understanding!